We hear a lot of rumors in the networking industry, and for me one of the benefits of going to Cisco Live is that it’s a great place to try and get to the core of an issue by talking to the technical experts, product owners, and business leaders at Cisco. Many would expect Cisco’s finest to spin a company line, but in fact they tend to answer questions with a remarkable level of honesty. Having been privileged to attend the private CCIE NetVet Reception with John Chambers last year, I can attest to the remarkable level of openness that can exist, even in an atmosphere colored by the press attention for Cisco over the dramatic downsizing that had just been announced. So will I be able to gain some clarity at Cisco Live 2012? Find out below, and as a special bonus I’ll share an exciting announcement with you! Well, this year’s US event, Cisco Live 2012 is coming up in just 3 short months: June 10-14, 2012 in San Diego! I really can’t believe how quickly it has come around again after last year’s great event in Las Vegas. If you want to know how I felt about it, and some of what went on, you can read my retrospective from last year. Apart from the breakout sessions, the Keynote speeches are one of the best ways to disrupt the rumor mill about what Cisco is doing and where it’s going. 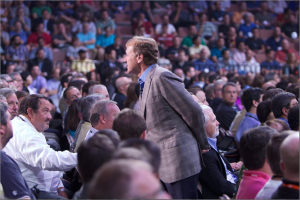 At Cisco Live 2011 we were treated to Keynote sessions from John Chambers (CEO) and Padmasree Warrior (CTO). These sessions are very valuable for partners in particular, but are a great outlook on where Cisco believes the industry is moving, and misconceptions are often clarified by the information that’s presented. Cisco Live 2012 will almost certainly mirror this format for the Keynote speeches on the Tuesday and Wednesday of the conference. 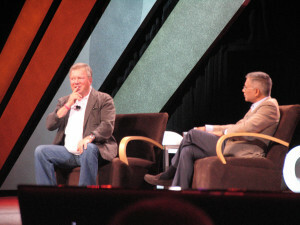 On the last day of Cisco Live there is a Guest Keynote slot, and in 2011 the guest speaker was the one and only actor/singer/raconteur William Shatner. The Guest Keynote is always my favorite because no matter how energized John Chambers’ speech is, you can’t beat listening to somebody famous sharing their thoughts with you. Previous years’ guest speakers have included Apple legend Guy Kawasaki (whose presentation was fabulous), author Ben Mezrich, and writer/actor Ben Stein (who I too often confuse in my head with Howard Stern’s father, Ben). Do they talk about Cisco? Not as such. If you’re lucky, there will be some tie in to something relevant to the theme of the conference, or in the case of Ben Mezrich, the conference location in Las Vegas (since two of his best-selling books were about Vegas), but the Guest Keynote speeches/interviews are as much for entertainment as they are for education. So while I confess that I have been very well entertained so far, these Guest Keynote speakers haven’t done much in terms of setting the record straight. Or have they? Last year, William Shatner busted the myth that he “could not do the Vulcan salute” by showing us the salute (although it should be noted that he executes it with just one finger). For those of us who have to create PowerPoint presentations, Guy Kawasaki imparted the very plausible advice that the smallest text you have on any slide should use a 30 point font, or – if you find that too arbitrary a number – find the age of the oldest person in the audience, halve it, and use that as your font size. You may be laughing right now… but try it. It works! Ben Mezrich confirmed that despite Mark Zuckerberg being the main character for his book The Accidental Billionaires (which was adapted to make the movie The Social Network), Zuckerberg refused to have anything to do with Mezrich and would not grant an interview. And so what of Cisco Live 2012? Exciting news, that’s what! Cisco have just let me know that the Cisco Live 2012 Guest Keynote will feature not one speaker, but TWO! We are to be treated to Adam Savage and Jamie Hyneman, perhaps most famous for the house-destroying Discovery Channel hit show, MythBusters! Yay! Seriously, that is AWESOME. I’m sure they’ll bring the house down, and we’ll have a ball! (See what I did there?). Ok, it’s a little unfair of me to associate Adam and Jamie with that particular incident, which is a textbook example of what happens when you let the kids play with guns. To Adam and Jamie’s credit – and I give them 110% props for this – they didn’t hide behind Kari, Tory and Grant (whose team had actually been pointing the cannon at a housing estate a hill in the Alameda County Firing Range). Instead they went out there, publicly faced the music on behalf of the show, and made what I felt were truly sincere apologies for what had happened. How many famous people would usually bother doing that when it wasn’t even them that did it? I have even more respect for these guys because of how they handled this incident. 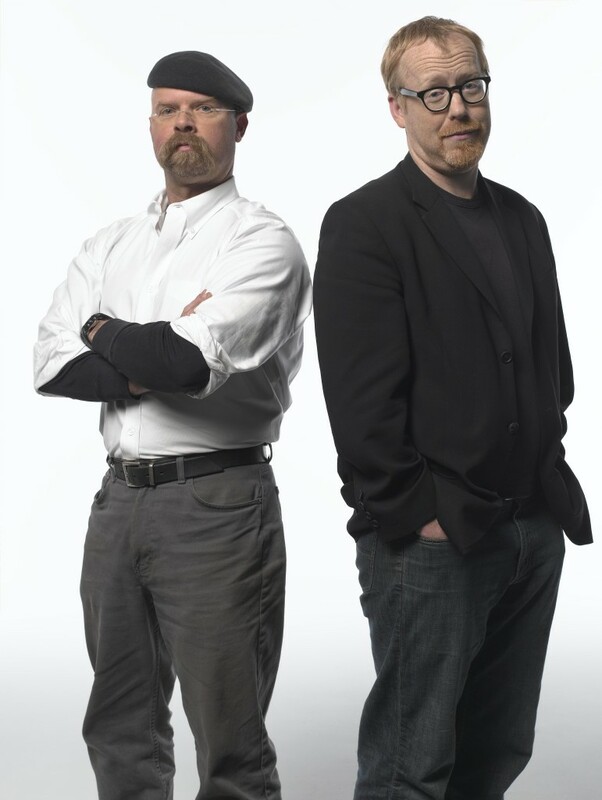 So am I looking forward to the idea of the guys from Mythbusters talking about – well, honestly, anything they want to talk about? You bet I am! I can think of very few speakers whose hands-on geekiness could better match an audience at Cisco Live. When you think about what these guys do for a living, it’s a perfect match. They have a queue of tickets (viewer suggestions) to work through; they assign themselves a problem (the myth), think of ways they could approach it, iterate through small scale tests and potential solutions until they’re confident that they can build a working model, then they deploy and troubleshoot as necessary. Goodness, it’s almost PPDIOO (or however many P’s and O’s Cisco are using these days) in action, and I’m going to guess that sounds like a pretty typical day at the office to most Cisco geeks. Let’s assume that the detonation represents the explosion in growth for Cisco’s UCS business? Maybe the mushroom cloud represents, um, blah blah Cloud? All I know is that if we get to see 7 or 8 different views of the same bit of Cisco’s business during one of the other Keynotes, there’s collusion involved. I am not sure yet if Jamie and Adam will be accompanied by the latest incarnation of Buster the crash test dummy, but I can’t help feeling that if he were to appear seated in some breakout sessions and at keynotes, it could be quite amusing. Perhaps we could also convince them to use TelePresence to bring Kari Byron to the party as well? I think that would be a productive use of technology, and I’d be willing to personally assist in setting up the remote TelePresence suite. I have been provided with more information and facts about New York City-born reality-substituting Adam and his Russian-speaking mustachioed friend Jamie than I can shake a stick at, and while I’m tempted to share it all with you, I also think that Jeff Fry did a more than adequate job of it on his blog, so I’m going to tell you go give him some traffic and read his blog post for lots of fun facts and “Did You Know” stuff. Really, it’s quite interesting, although (in American Idol fashion), don’t click until the end of the post, mmmkay? I don’t want to lose you quite yet! So what are you waiting for? You know it’s the right thing to do – go register for Cisco Live 2012 if you can. 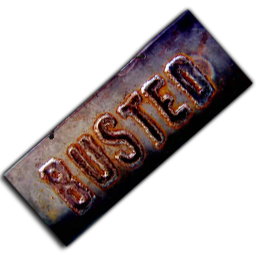 There are plenty of good business reasons to attend, and having the Mythbusters there provides two more reasons just for you! Update: (Mar 19, 2012): Cisco now have their official Guest Speaker page up – check it out! What Does It Mean To Be A CCIE?